Vancouver, British Columbia--(Newsfile Corp. - August 13, 2018) - EMX Royalty Corporation (TSXV: EMX) (NYSE American: EMX) (the "Company" or "EMX") is pleased to provide an update on recent advancements on two of the Company's royalty properties in Turkey. Highlights include new drill results from the Balya lead-zinc-silver carbonate replacement deposit in northwestern Turkey, and continued development permitting of the Sisorta high sulfidation gold deposit in northeastern Turkey. EMX congratulates Dedeman Madencilik San ve Tic. A.S. ("Dedeman") and Bahar Madencilik Sinayi ve Ticaret Ltd Sti ("Bahar"), the owners and operators of the Balya and Sisorta royalty properties respectively, on their progress in advancing the projects. Please see www.EMXRoyalty.com for more information. Balya Royalty Property Update. The Balya royalty property contains extensive zones of carbonate replacement deposit ("CRD") style lead-zinc-silver mineralization, and is located in the historic Balya mining district. EMX holds an uncapped 4% NSR royalty that it retained from the sale of the property in 2006 to Dedeman, a privately owned Turkish company. Dedeman has continued small scale underground production at Balya, while accelerating its exploration efforts. Earlier in 2018, EMX received royalty revenues of US $121,075 from Balya production completed in 2017. Dedeman has since informed EMX that it commenced a 24,000 meter diamond drill program to expand the current drill-defined body of mineralization in the Hastanetepe zone. Dedeman has provided EMX with initial results from the 2018 drill program, which include 12.75 meters averaging 11.39% lead, 5.92% zinc and 225.18 g/t silver in hole DB108-B (true width ~95% of intercept length), as well as several other significant intercepts in nearby holes at Hastanetepe (see Table 1 for drill results from the ongoing program). The results are especially encouraging in that they show continuity in previously drilled areas of high grade lead-zinc-silver mineralization along the southern edge of the Hastanetepe zone. Additional drilling in 2018 will fill in a ~500 meter gap between the southern edge of the Hastanetepe zone and the southwestern property boundary (see Figure 1). Little to no drilling has been previously conducted in that area, even though significant mineralization was intercepted in reconnaissance holes DB-29 and DB29-A near the property boundary in 20081. 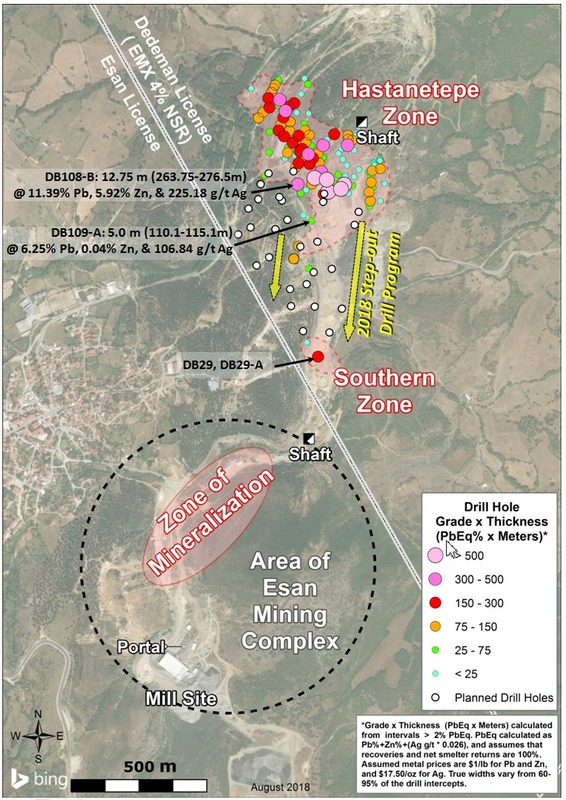 Directly southwest of the 2008 holes and Dedeman's property boundary lies the mining complex of Esan Eczacıbaşı Endustriyel Hammaddeler Sanyai ve Tic. A.S. ("Esan"), which mines and processes similar styles of mineralization to those found on the Dedeman property. Sisorta Royalty Property Update. The Sisorta project, located in the Eastern Pontides mineral belt, is a near-surface, volcanic-hosted, high sulfidation epithermal gold deposit. Previous exploration by EMX and its partners outlined a 1,000 by 600 meter zone of shallow oxide gold mineralization with underlying copper and gold porphyry potential at depth. In 2016, EMX sold the Sisorta project to Bahar, a privately owned Turkish company, for staged cash payments and an uncapped 3.5% NSR royalty2. Bahar informed EMX that it has commenced with Environmental Impact Assessment ("EIA") work in 2018 as required under the mine permitting process in Turkey. Once complete, Bahar intends to continue applying for other necessary permits for project development. Bahar advises that the permitting process is expected to take 1-2 years. Comments on Sampling, Assaying, QA/QC, and Adjacent Properties. Dedeman's drill samples were collected in accordance with industry standard best practices. The samples were submitted to ALS laboratories in Izmir, Turkey and Vancouver, Canada (ISO 9001:2000 and 17025:2005 accredited) for sample preparation and analysis. Silver and base metal analyses are determined by four acid digestion and ICP MS/AES techniques. Over-limit analyses are performed by atomic absorption, and in some cases (>30% Pb and >30% Zn) by volumetric titration techniques. Dedeman performs routine QA/QC analyses on their assay results, including the utilization of certified reference materials, blanks, and duplicate samples. EMX conducted a field review of Dedeman's Balya mining operation, exploration drilling program, and sampling, logging, and QA/QC protocols in May 2018. Esan's project provides context for EMX's Balya royalty property, which occurs in a similar geologic setting. However, this is not necessarily indicative that Balya hosts mineralization with similar tonnages or grades. Readers are cautioned not to place undue reliance on these forward-looking statements, which speak only as of the date of this news release or as of the date otherwise specifically indicated herein. Due to risks and uncertainties, including the risks and uncertainties identified in this news release, and other risk factors and forward-looking statements listed in the Company's MD&A for the quarter ended March 31, 2018 (the "MD&A"), and the most recently filed Form 20-F for the year ended December 31, 2017, actual events may differ materially from current expectations. More information about the Company, including the MD&A, the 20-F and financial statements of the Company, is available on SEDAR at www.sedar.com and on the SEC's EDGAR website at www.sec.gov. Table 1. Balya Select Drill Intercepts (August 2018). DB108 144.75 146.25 1.5 0.02 2.21 4.00 TD 207m, vertical. True thickness ~65% of intercept. DB108-A 132.0 134.0 2.0 0.03 3.46 4.00 TD 198m, az=125, incln= -77. True thickness ~80% of intercept. 186.8 188.5 1.7 2.25 0.27 18.35 ~95% of intercept. * Over-limit re-analyses for >30% Pb pending from Dedeman. Specific intervals set to over-limit value of 30% Pb as noted. Figure 1. Balya PbEq% Grade x Thickness Drill Map (August 2018). 1 See EMX news release dated December 5, 2008. 2 See EMX news release dated August 3, 2016.